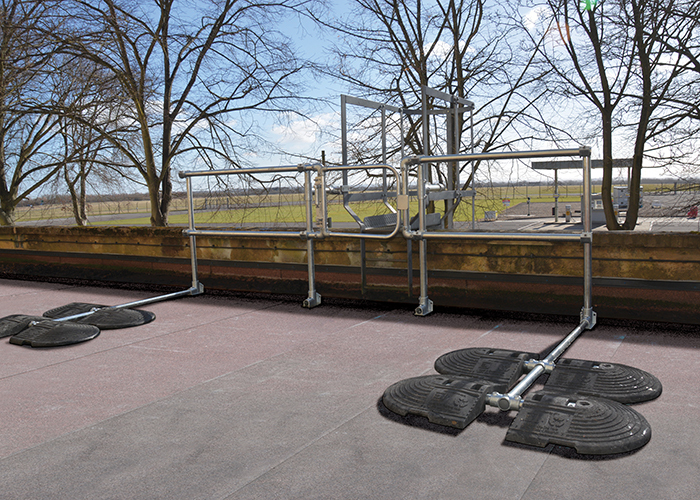 KEEGUARD Ladder Kit provides permanently fixed guardrail either side of an existing fixed ladder and a self-closing swing gate permitting safe roof access for the purpose of inspection or maintenance work on roofs. The kit has been specifically designed to provide a “retro-fit” solution to existing fixed ladders/cat ladders to ensure the complete assembly complies with EN 14122-4. EN 14122 – Safety of machinery – permanent means of access to machinery – Part 4 – Fixed Ladders, states that: “To prevent falling through the access opening at arrival areas the opening shall be provided with a gate. It also states that at “drop edges of arrival areas”, a Guardrail should be provided at least 1.5m either side of the ladder, or if the drop edge is less than 3m in length, then one should protect the entire edge. Our KEEGUARD Ladder Kit has been specifically designed to meet the EN 14122-4 standard, and was independently tested to check its conformity. KEEGUARD Ladder Kit has been developed to easily clamp on to the existing fixed/cat ladder and forms a continual link from the guardrail to the stringer of the ladder. The unique fitting connecting the guardrail to the fixed/cat ladder can clamp around a flat or tubular stringer up to 75mm in width/diameter. The kit's design provides permanent edge protection without the need to mechanically fix the system through the roofing membrane or building’s structure. Find out more about our self closing safety gates range KEE GATE. Learn more about our free standing roof edge protection system KEEGUARD.